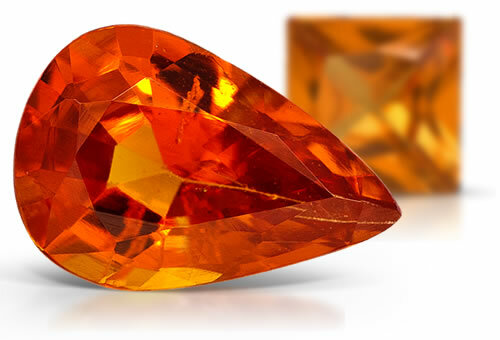 While it was once just a collector's gem, spessartite, an orange variety of garnet, made its move into the mainstream during the 1990s when new deposits were discovered in Africa. Like most garnets, spessartite is typically untreated, so the beautiful color and clarity that you see in them is just as nature created it. Spessartite garnet is named after its first discovery in Spessart, Bavaria, in the mid 1800's. Orange, Brownish Orange, Yellowish Orange, Reddish Orange, Red-Orange. Never Any Purple Component. RI, SI nature, and spectrum. Color is also helpful. Spessartite garnet is a type II clarity stone. Stones might have 2-phase, liquid inclusions that are feathery in appearance and rutile needle inclusions.